Whether the position of Domino A200 printer ink line is correct will directly affect the printing effect. Thus it is very important to correctly adjust the ink line of Domino A200 printer to the right position. How to judge the position of Domino A Series Printer ink line is correct? 1. Remove Domino print head cover so that the print head assembly can be seen. Viewing in the front, the correct ink line position should be 1/4 left of the recycle tube (suitable for Domino Nozzle 60 micron or 75 micron), while 1/10 left is available for 40 micron nozzle. 2. 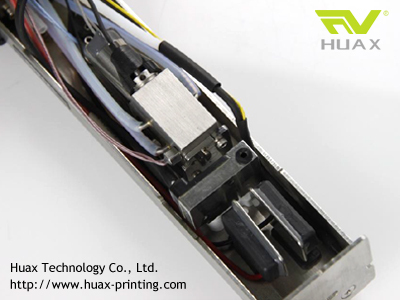 Rotate the Domino print head by 90 degree centigrade, the correct position for the ink line should be in the middle of the recycle tube, which is available for nozzle with size of 40 micron, 60 micron or 75 micron. 3. The ink line is in the middle of the Domino Charge Electrode and parallel with it. 4. The ink line is parallel with right of Domino Deflector Plate and with distance of 1-2mm to it. How to adjust Domino A200 printer ink line position? Typing the password "service" on the keypad, and press "confirm", then enter the service menu. Keep pressing the green button and type the password of "maigret" at the same time, choose "confirm" to enter senior service menu; by pressing "manual", the manual mode is chosen. Then successively open the ink solenoid valve and Domino Pump, when the present value and setting value of the ink is nearly the same, open the Domino Head Valve Solenoid, then choose the "regulation" as "pressure", finally the manual setting mode is ready. 1. Use a hexagon screwdriver with size of 1.5mm to loosen the screws. If the ink line is offset to the left, slightly adjust the cam mechanism to the right; if the ink line is offset to the right, then slightly adjust to the left. 2. If the ink line is offset to the front, the screw is also needed to be loosen, and please use a hexagon screwdriver to slightly adjust the screw to the left; if the ink line is offset to the back, then need to slightly adjust the screw to the right. After finishing the above two steps' adjustment, please check whether the location of the ink line is in the middle of and parallel to the charging slot by watching through the print cover magnifier. If it is, then the adjustment job is finished; if not, please adjust the location of the Domino charging slot. Through the above steps, Domino A200 printer ink line position is well adjusted, then we can exist the operation, and start the machine. More technical details on Domino A200 printer, or any inquiries and orders of Domino Spare Parts and Domino Filters, please feel free to contact with us, Huax Tech will sincerely try to help you.